Nebraska’s losing streak has reached six after a 60-45 loss to Maryland on Wednesday night at Pinnacle Bank Arena. The Huskers are now 13-10 and 3-9 in league play while the Terrapins, who had lost three of their last four, improve to 18-6 and 9-4 in the Big Ten. Here are three takeaways from Wednesday’s action. Through the first 8:23, Roby had taken eight of Nebraska’s first 13 shots and four if its first six free throws and scored 12 of its first 15 points, giving the Huskers an early seven-point lead and drawing a timeout from Maryland. He took a couple of open 3s without hesitation, hitting one off the dribble after a kick out. 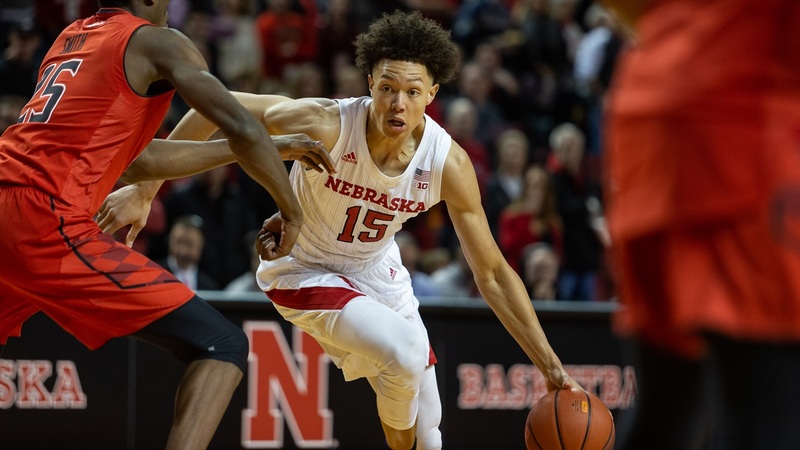 Nebraska went away from Roby for a bit and started playing through its guards to poor results, and Roby cooled off in the process, missing his last four shots of the half. Roby’s effort continued, however, blocking shots, grabbing boards and getting deflections. He got going again in the second half, with this grab-and-go blow-by on Bruno Fernando as the highlight of an otherwise miserable game for Nebraska. Roby still needs to be able to finish through contact much better than he does (he missed too many shots around the rim) and he needs to continue to polish his shot from the free-throw line and the perimeter, but he showed a lot against the Terrapins. Roby finished with a game-high 20 points but he shot just 7-of-22 from the field including 2-of-6 from 3 and 4-of-8 forms he free-throw line. He added 14 rebounds, five blocks and two steals to his stat line. Nebraska did a pretty good job of keeping Maryland’s top two scorers in check. Anthony Cowan Jr. didn’t get many open looks and finished with five points on 2-of-10 shooting while Tanner Borchardt made Bruno Fernando work for everything he got. The sophomore finished with 19 rebounds but only three of those were offensive and he had 13 points. But Nebraska had no answer for Maryland’s 5-star freshman Jalen Smith. After staying out of foul trouble against Illinois, Borchardt picked up two early ones. Tim Miles opted to go small with Nana Akenten at the four and Smith took advantage, scoring nine straight points by himself. Miles tried going big again with Brady Heiman at the five and Roby back at the four, but that didn’t really slow the Terps down or get the Huskers going again. Smith, who hit the go-ahead shot late against Nebraska that proved to be the game-winner in College Park, finished with a team-high 18 points and 11 rebounds. Talent isn’t everything, but it sure does help. I don’t have the words to accurately capture just how bad Nebraska’s offense was against Maryland. Nebraska shot 12-of-57 from the field for a season-low 21.1 percent. The Huskers were 4-of-17 from 3 (23.5 percent, somehow better than their 2-point percentage). The free-throw line (17-of-26, 65.4 percent) was the only reason Nebraska even cracked a point-per-minute in the game, the Huskers didn’t even shot all that well from there either. Per Nebraska’s shot chart, the Huskers shot 6-of-20 on dunks and layups, continuing a brutal trend for the Huskers. Late in the game, James Palmer Jr. had a contested shot circle the whole rim before popping back out, providing a perfect encapsulation of this game and, really, this entire losing streak for Nebraska. The Huskers just can’t find a way to score. Nothing they try is working. Roby was the only Husker to make more than two shots in the game, and it took him 22 shots to make seven. If you can’t make layups, and you can’t make jumpers, and you can only kind of make free throws, what’s left?